I just wanted to let everyone know that we are back from Mexico and I have LOTS of stories to tell! It was quite the eventful trip (which is not a good thing). I will post some pictures and stories soon! I need to get them off of my camera first. I haven't been able to stamp yet, which is depressing, but I will hopefully get lots of that done this week. My hubby is leaving me to go work somewhere up in Wyoming for a couple of days :(. I will miss him greatly! I will be back on shortly! Thanks for stopping by! I FINALLY finished the project I started a couple of weeks ago! My parents are here so my dear momma helped me with them! I decided to make these for all of the 44 teenagers and adults that are going on our missions trip this next week. I decided that since they won't be able to spend Easter with their family, I would do a little something for them. It was a lot of work so I hope they like them! I can't remember where I saw these things first but I do know that Dawn posted a video tutorial on them if you would like to see how exactly to make them! Well, I am sorry for the short post but I need to spend some quality time with my family. My brother is going with us this week and he is REALLY sick so be praying for him and the rest of us on the trip! We are going to be crossing the border into Mexico Sunday evening and there has been some violence on the borders so be praying for safety in that area as well! I will post again in a week! I will miss you all. Hehe! 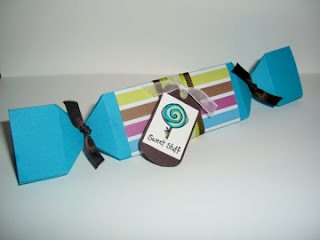 Here is an up close picture of what these cute candy matchbooks look like. We did them in a hurry so they aren't the greatest. I didn't care a whole lot though because of the large amount I had to make and the little time I had to make them! 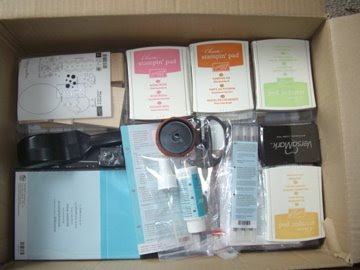 This is a picture of all of them in the box! I hope they travel well. I guess we will only find out! The wonderful Free Wheelin' Promotion starts TODAY! Yay! :D Here's the dealio, if you buy a stamp set from the chart below you will receive the coordinating jumbo wheel for FREE! This is such an incredible deal and I am sad to discover that I could have gotten a free wheel if I would have waited to purchase Pun Fun. By the way, everyone should order that set. It is so versatile and cute! :D There are lots of great sets to choose from so make sure you don't miss this awesome deal! If you are interested in a set, let me know! Also, if you would like to print out the brochure, click on the link in the right hand column. I'm Back With a Cute Project! I am so sorry that I haven't posted in so long! We have been crazy busy getting ready for our mission's trip to Mexico and my family coming to visit! My family will be arriving tomorrow afternoon sometime and I am extremely excited! I haven't seen them since Christmas so it will be nice to spend some time with them. The sad part is that we will only get 2 days with them before we have to leave for Mexico. On a good note, my new SU! order should be here tomorrow! 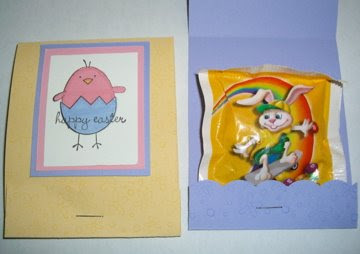 Anyway, since my family is coming, I decided to make them little welcoming/Easter gifts! 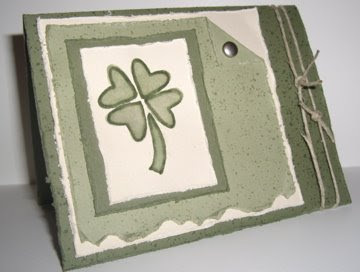 I am trying to get my mom into stamping and I figure what better way than to show her some cool projects you can make! So, without further ado, here is what I made! 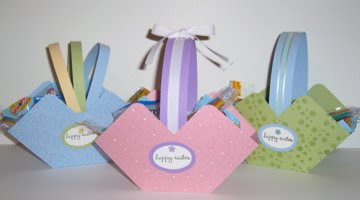 Let me tell you, these baskets were incredibly easy to make! I think I will try and create a tutorial on them so that you can make one yourself but that may take a few days. You will have to have some patience with me. For the time being I will just tell you what I did. First I took a piece of 8 1/4 x 8 1/4 and scored each side at 2 3/4 and 5 1/5. I then cut two opposite sides to the first score line. After that I took my corner rounder and rounded off the corners of the outside squares. Once I had stamped and done all of my folding I brought in the flaps and paper pierced a hole where I wanted the brads to go. I then created a handle and there you have it! I hope all of this makes sense. It probably doesn't but I guess you will have to wait until I get the tutorial done. Sorry about that! Well, I am not sure how much posting I will be able to do within the next week and a half! I will be home from Mexico on the 29th! If I don't post before then, Happy Easter everyone! You heard right, Stephanie is officially a SU! demonstrator! I currently have 0 customers and am always looking for some potential buyers so...if you need anything...let me know! Since I am a demonstrator now, I have a new SU! website. It is currently under construction but I would love it if you gave it a little peek. I am working on uploading some of my new projects onto it and I have a calendar of some upcoming events that will be taking place. If you are interested, let me know, I would love to talk to you! Just a reminder, Sale-a-bration is still going on but it will expire on Monday (March 17th) so if you would like to order one and want to earn some free stamp sets, let me know! You can view the great SAB catalog by clicking on the picture. 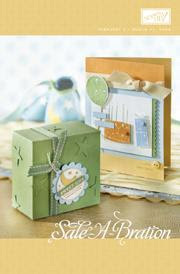 You can also purchase some amazing sets from our new Occasions Mini catalog right now too. Be sure to check it out because there are some adorable new sets in there! I have already made a couple of purchases from it and I am so excited to get them! I will show you what I got soon! If you would like to take a look at that brochure click here. Obviously the catalog is available to view as well. Thanks for checking me out! I am just so excited I can hardly stand it! This was such a great sight this morning! I woke up (feeling under the weather), hopped into the shower, and when I walked into the kitchen to get some cleaning done I noticed this on my deck! Let me tell you, I was so excited! However, I was not expecting it to be so early so I had to put it on hold for a couple of hours so that I could get my work done. I knew that once I opened it I would have problems! Here is what I saw when I opened it! The excitement just grew and grew from there! 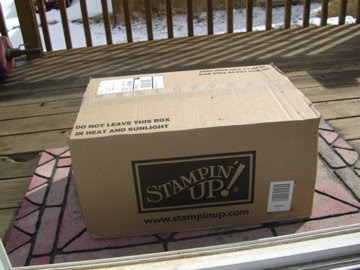 After I got the box unloaded and spread it out all over the floor this is what my stamping room looked like! Haha! 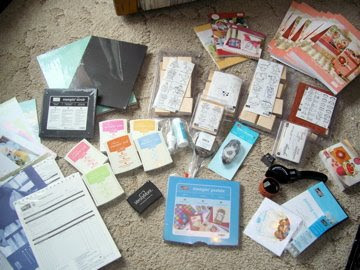 As you can tell from all of the stuff I got, this is my demonstrator starter kit! I just recently signed up because my husband and I decided this was a great opportunity for me. I spend most of our money on it anyway so I might as well save a little and make a little while I am at it (hehe)! Well, I am not going to end this post without showing you a new card so here it is! As a quick side note...I just realized I passed 1,000 on my counter! I know, it doesn't sound like much, but I think it causes reason to celebrate anyway! :D SO, be looking for some blog candy in the near near future! Today's card was a fun one! 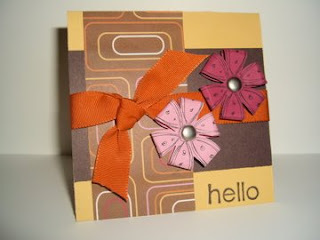 I saw this card on Dawn's blog and just had to try making my own! I love how unique it is! Here is a picture of the front of the card. 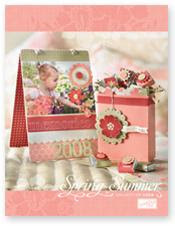 To make this card I cut Cameo Coral card stock at 4 1/4 X 11. I then found the center on one end of the piece and cut at an angel from the center point to the outer 5 1/2 score line. Then all I did was adhere the Cameo Coral piece to the back of the Whisper White card, cut a slit with my hobby blade in the front of the card, and decorated it! 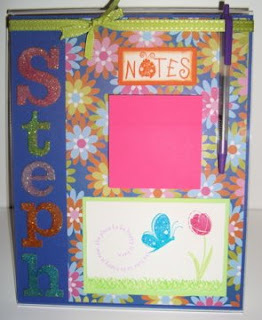 I had to add some glitter to the card so I put some in the little dots on the butterfly and the ladybugs! :D What is a card without bling??? Try one of these! They are lots of fun! Here is another view of the card with the top flap open! I love how layered this card is. There is just so much dimension to it! I did my first color challenge from SCS this week! The color challenge (last weeks challenge actually) that I did was using Wild Wasabi, So Saffron, and Purely Pomegranate. However, I had to substitute the Wild Wasabi for Glorious Green and the Purely Pomegranate for Rose Red because I do not have those two colors (it was allowed). I also decided to use the sketch challenge from Lindsay's blog again! I love her sketches so if you ever need some help with a sketch, check her site! 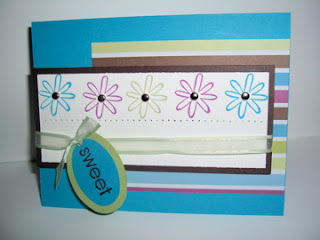 I stamped the main card with the Itty Bitty Backgrounds stamp and pierced the little strips of paper. I also decided to break up the green strip with the green layer behind the main image with a piece of Creamy Caramel. 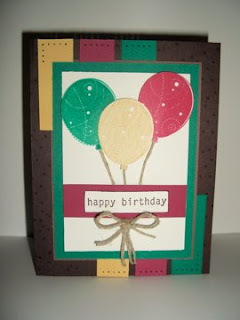 I then stamped the balloons in the three colors, cut them out, and stuck them on with dimensionals. I think everything else is pretty self-explanatory! I hope you like it! Sweet Stuff for a Friend! Here is a card that I made to accompany the cute treat! I partially cased a card that Amy did. She too has an incredible blog that you NEED to check out! Well, sorry for the short post tonight but I haven't seen my hubby all day! We had our SU! 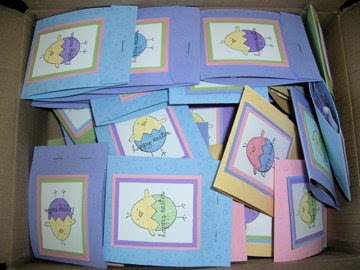 card party today so I will have cards to share from that soon! Beate's Weekend Sketch Challenge Time! Here is a sneak peek at the project I am working on! -Share seven random and/or weird facts about yourself on your blog. -Leave a comment on their blogs so that they know they have been tagged. 1. My husband and I love to make funny faces at each other for some random entertainment! 2. We are also hooked on "The Office" even though we don't get any t.v. channels. We have to rent it through NetFlix! 5. I think it's Christmas when our class gets an order from Scholastic! I LOVE books! 7. I get sick to my stomach almost every night. It has happened since I was in elementary school. 8. My SU! catalog is falling apart because I look at it too much. 9. I am obsessed with Disney movies AND their soundtracks. Guess what my students listen to when I am feeling the urge at school??? Hehe. 10. I hate boogers...like I REALLY hate them! Why is it that men insist on using their fingers when a kleenex is within arms reach? I have yet to figure it out! I guess I should probably get over it since I teach 2nd grade! And as promised, here are some pictures of our gorgeous view! And some other random pictures from our neck of the woods! My Favorite Quick and Easy Recipe! 1. Preheat oven to 475°. Hold the end of an asparagus stalk and bend until it snaps off. Repeat with remaining stalks and discard woody ends. 2. Toss asparagus with olive oil, sprinkle with salt and pepper, and toss well. Arrange asparagus in an even layer in a shallow baking dish. 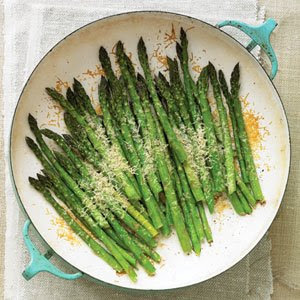 Sprinkle with parmesan cheese and bake until asparagus is crisp-tender and cheese is browned, about 10 minutes. Sprinkle with lemon juice. Serve hot or warm. And Today There is a Blizzard! Not kidding. It's a blizzard outside. After our 60 degree weather yesterday I guess we are due! Oh well. We are supposed to go to the Springs today for a Winter Jam festival and we are hoping we don't have to cancel it. Winter Jam is a huge concert for youth. Mercy Me, Barlow Girl, Skillet, Newsong, Mandisa (hehe), and a bunch of other bands are going to be performing so we are really excited for it. Oh yeah, the most exciting part is...it only costs $10 at the door! Anyway, I guess that means I won't have a whole lot of time to stamp today. Oh well, there are worse things in life. 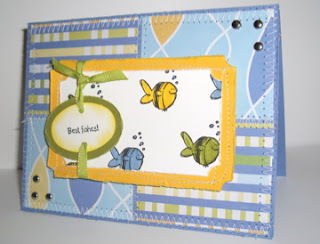 Here is a card that I made late last night for Beate's sketch challenge and SCS limited supplies challenge. A double whammy. Can't beat that! 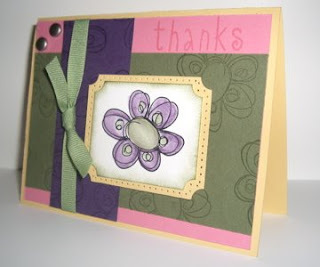 For the limited supplies challenge you could only use one flower stamp and one sentiment. You also couldn't use any d.p. or other images. Luckily we could use embellishments! I'm not a huge fan of my paper piercing but I guess I don't mind it too much. And sweet it is! It is sunny and warm today! A whopping 60 degrees! It's incredible here. The sun here in Colorado is so powerful too so it makes it feel like it is in the mid 70s! I LOVE COLORADO! :D Anyway, I didn't have a whole lot of time to stamp today because Nick and I spent a lot of the day outdoors. 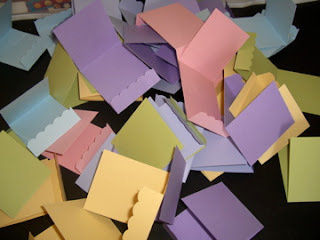 I did however make a sticky note holder! I had been wanting to make one of these for quite some time and I finally got around to doing it. As most of you know, I am a huge fan of bright colors so I used as many as I could! I hope you enjoy!When we get my desk done I will be sure to get a picture of it on the desk! Oh, I am also going to make a pen to go with it. That will hopefully happen in the near future!